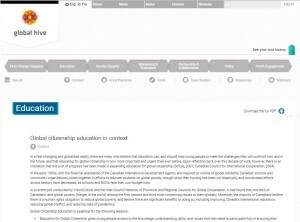 Global Hive / Ruche mondiale is a fully bilingual online toolkit that combines practical tools, case studies, and best practices on how to engage Canadians in order to inspire global citizenship. The content within the Global Hive is the culmination of months of collaboration and idea generation by dedicated groups of public engagement practitioners and other experts in thematic Knowledge Hubs across Canada. The Knowledge Hub processes were carried out in a participatory way and each was facilitated by a provincial or regional council, and each included hand-picked experts from across Canada. The Global Hive is a project of the Inter-Council Network, of which SCIC is a member. To learn more about the 3-year research project that led to the Global Hive, click here.